Genentech, a leading biotechnology company and member of the Roche Group, recently announced promising results on a pivotal Phase III clinical trial (ORATORIO) assessing its investigational therapy ocrelizumab as a treatment for patients with primary progressive multiple sclerosis (PPMS). Multiple sclerosis (MS) is a chronic, progressive neurodegenerative disorder that results from an abnormal attack on the central nervous system (brain, spinal cord and optical nerves) by the body’s own immune system, causing inflammation and damage to the myelin layer that covers and protects neurons, resulting in motor function impairment, irreversible neurological disability and paralysis. There is no cure for MS, and it is estimated that more than 2.3 million people in the world suffer from the disease. Progressive forms of MS are estimated to affect at least 40% of all MS patients and are characterized by a gradual, steady progression of disability, leading to impaired vision and walking, pain, fatigue, incontinence and cognitive changes. Patients usually have a poor response to treatment and there is little or no recovery. According to the National Multiple Sclerosis Association, progressive forms of the disease include Primary Progressive Multiple Sclerosis (PPMS), which is diagnosed in 10% of all MS cases and is characterized by a steady progression of the disease from the time of diagnosis, and Secondary Progressive Multiple Sclerosis (SPMS), where patients initially experience a relapsing-remitting MS phase (RRMS) of neurological dysfunction that later evolves in approximately half of the cases into a secondary progressive disease. Ocrelizumab is a humanized, monoclonal antibody against immune B cells that express CD20 proteins at their surface. These cells are thought to be a key contributor to the myelin and neuron damage in MS patients. The ORATORIO (NCT01194570) study is a multicenter, double-blind, randomized, placebo-controlled, Phase III clinical trial developed to evaluate the efficacy and safety of ocrelizumab (administered intravenously as two 300 mg infusions two weeks apart) in 732 patients with PPMS. Researchers now report that the ORATORIO study has met its primary endpoint, as ocrelizumab treatment was found to significantly reduce the patients’ clinical disability progression in comparison to a placebo. In the trial, clinical disability progression was defined as an increase in the Expanded Disability Status Scale (EDSS) sustained for a period of at least 12 weeks. In terms of safety, the occurrence of adverse events in the patient group given ocrelizumab was similar to the one in the placebo group. The most common adverse events reported were mild-to-moderate reactions related to the infusion. The safety and efficacy of ocrelizumab has also been evaluated in Phase III clinical trials (OPERA I and OPERA II) in patients with relapsing forms of MS (either RRMS or SPMS with relapses), having yielded promising results, as ocrelizumab treatment significantly reduced the annualized relapse rate, the progression of clinical disability assessed by EDSS, and the number of MS lesions in the patient’s brain in comparison to IFN beta-1a treatment. 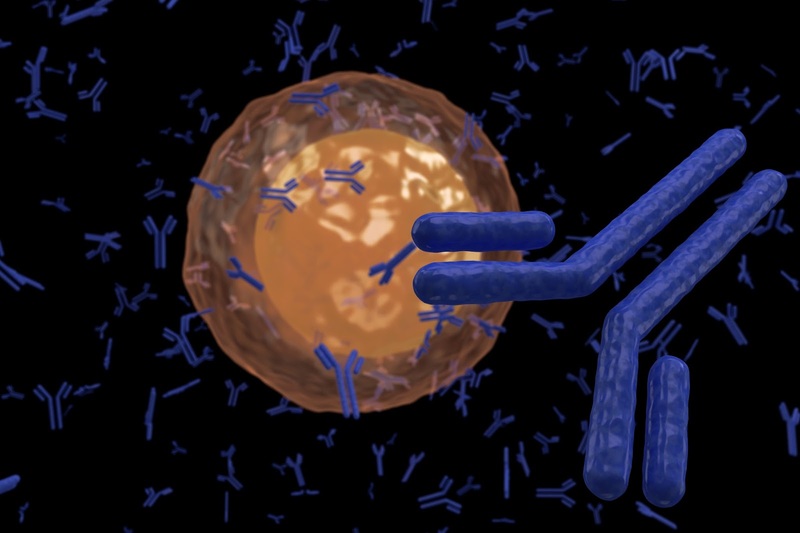 Together, the results of these three clinical trials support the theory that immune B cells play a key role in MS and that ocrelizumab can be considered an effective therapy for the disease. The ORATORIO trial results will be presented at the upcoming 31st Congress of the European Committee for Treatment and Research in Multiple Sclerosis (ECTRIMS) in Barcelona, Spain, as a late-breaking abstract by Dr. Xavier Montalban, chair of the Scientific Steering Committee of the ORATORIO trial and professor of Neurology and Neuroimmunology at Vall d’Hebron University Hospital and Research Institute, Barcelona, Spain. The presentation is scheduled for Saturday, October 10th (8:52 – 9:03 am CET, Abstract #228). Results from the Phase III trials OPERA I (NCT01247324) and OPERA II (NCT01412333) in relapsing forms of MS will also be presented at the Congress by Dr. Stephen Hauser, chair of the Scientific Steering Committee of the OPERA studies and chair of the Department of Neurology at the University of California San Francisco School of Medicine. The presentation is scheduled for Friday, October 9th (14:40 – 14:52 pm CET, Abstract #190). Genentech is currently planning to obtain marketing authorization for ocrelizumab as an approved therapy for both PPMS and relapsing MS, and plans to submit data on the ORATORIO and OPERA I and II trials to the U.S. Food and Drug Administration (FDA) in early 2016. Multiple Sclerosis News Today, from the BioNews Services group, plans to cover the ECTRIMS 2015 Congress and offer the readers real-time data and updates as they are disclosed at the meeting.